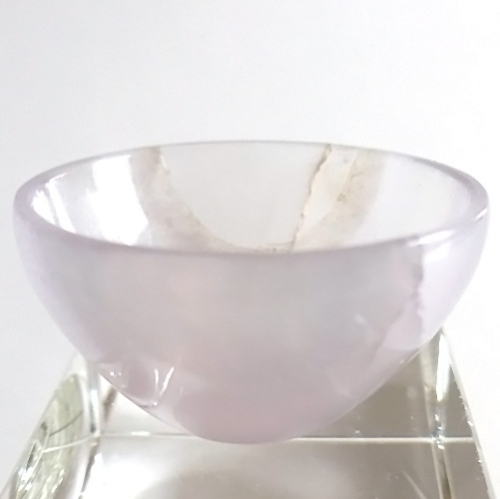 This extremely translucent lavender-grey fluorite bowl is 1" high, 2" in diameter, and weighs 2 ounces, 59 grams or approximately 1/8 pound. We have a good selection of these bowls and each one is unique and beautiful as you can see from the group shot below. Fluorite can display blue, blue-green, green, turquoise, royal blue, purple, and lavender-grey coloration, as in this beautiful specimen. Lavender grey fluorite is said by crystal healers to activate and energize the crown chakra, enhancing the connection to Higher Mind -- all forms of spiritual guidance become more readily accessible. 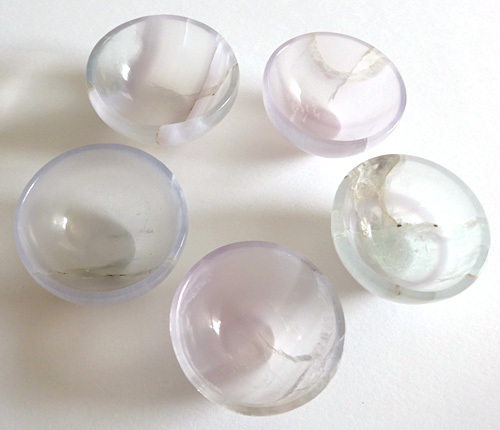 Since lavender is a pale variety of violet, lavender-grey fluorite is an excellent stone for working with the Violet Ray and the Violet Flame. Note: Above weight is shipping weight. Net weight is 57 grams or 2 ounces.